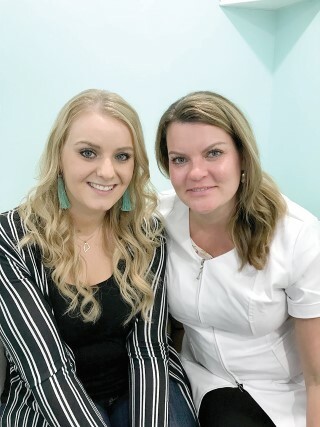 Susan Leo and Natalie Lytle, owners of Stillwater Spa, joined together to bring Windham new options for massage therapy and aesthetic work in a calm, serene space. They are conveniently located in the heart of Windham, at 690 Roosevelt Trail, next to Rose’s Italian Restaurant. “We’re small and customized,” said Lytle. The two opened the spa in June and in July someone drove a car into their waiting area. It is now just about repaired, but it hasn’t stopped clients from taking advantage of the services offered. The space was specifically designed for their spa with large treatment rooms and a comforting place to relax and be pampered. The location particularly interested them because of its accessibility for handicapped clients as well as being all on one floor. Susan, a licensed massage therapist, is a 2013 Spa Tech graduate and has years of experience with many different types of clients. She specializes in deep tissue massage, but also does neuromuscular, hot stone, silicone cupping, lymphatic, sports and prenatal massages. Her massages are sometimes a combination of techniques. The cost is $90 for a 90-minute massage or $70 for an hour. “Anybody with pain can benefit from massage,” said Lytle. Massages are recommended when needed or approximately every two weeks. Susan had her first massage at age 16. “I wanted to do something that makes people feel good after. It’s so beneficial for the blood flow and to help them stay positive,” she said. “There’s nothing I like better than seeing someone I’ve never seen before,” she added. Lytle is a licensed esthetician who worked at a local Windham spa before going out on her own in Portland. She’s happy to return to Windham, where she resides with her family, to see clients. She offers specialized facials, deep exfoliation, detoxifying foot soaks, body treatments, full body waxing using hard or soft wax, and offers top-of-the line skin care products by Hale & Hush, Circadia, Le Mieux and Color Up Therapeutics. Lytle works with clients for many different needs including anti-aging, acne, rosacea, and those who have sensitive skin. Every facial is customized to the individual’s needs. She also uses LED light therapy that was developed by NASA. Each different color light helps to repair or kill bacteria. It’s a very rare treatment in the Sebago area. Lytle is certified in dermaplaning, the removal of dead skin cells with a scalpel as a manual exfoliation technique. “Skin is our largest organ. I like the idea that there are products and techniques that can help the cellular make up of skin,” Lytle said. Teen facials are also popular, and Lytle offers education and discussion about good skin care habits to help keep their complexion healthy. Additional services include eyelash and eyebrow tinting and lash lifting, which is like a perm for lashes. The spa carries homemade rice bags and other fun retail items for beauty and relaxation and sells gift certificates which will be a great option for the holidays. Our clients are mothers, daughters, friends and men. Some come to find out their skin type. “Facials are a workout for your skin. Massage and skincare are not always a luxury,” Lytle said. Our services can prevent premature aging and benefit your overall well-being, she added. Facials range in price from $75 to $90. All treatments are by appointment only, all of which can be booked online. Don’t miss out on the Stillwater Duo, a one-hour massage and one-hour facial for $130. “I regret taking such good care of my skin.” said no one ever! 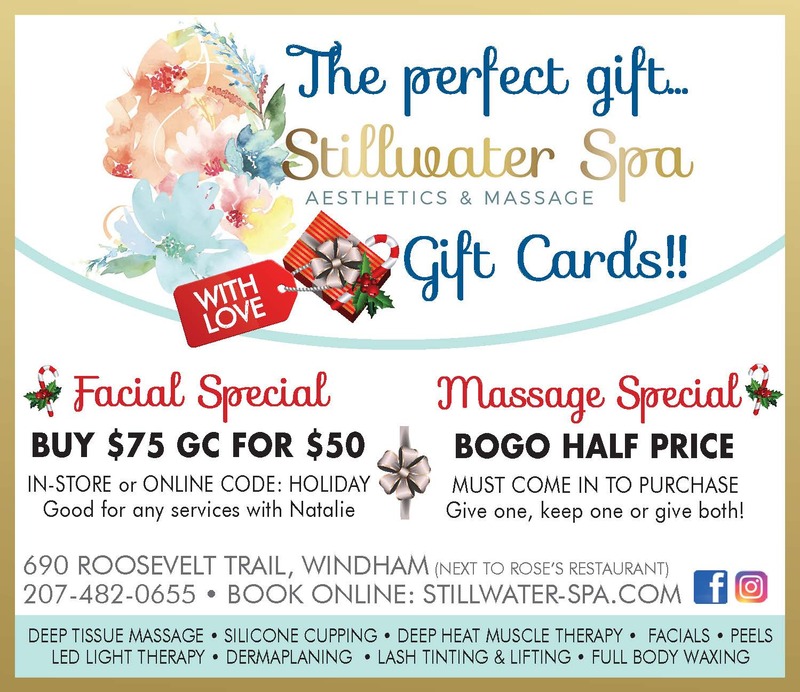 For more information or to schedule an appointment, visit www.stillwater-spa.com or call 207-482-0655. Find Stillwater Spa on Facebook or Instagram.